Claressa Shields vs Christina Hammer, the biggest fight in the history of women’s boxing without a shadow of a doubt. No pressure, then. The winner would become only the second female undisputed champion of the world and whilst Shields was the betting favourite, this was a genuine pick’em going into fight night. Hammer, the WBO middleweight champion, stepped into the ring with a beaming smile on her face in stark contrast to the dead-pan nonchalance, borderline disgust, of Shields. The American, double Olympic champion, was in supreme confidence of adding a fourth governing body’s belt to her collection. Her German counterpart, however, started off the liverlier fighter. 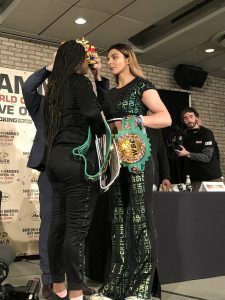 Characteristically fighting tall, Hammer was using her three inch height advantage well and making her jab do the talking. Shields flailed her punches inwards for the opening round, attempting to cut into the body of Hammer but often catching the German on her arms. The second round saw Shields looking to start fast and shell-shock Hammer but the 28 year old, a professional for 10 years, remained confident in her gameplan. Rocking on the balls of her feet and working sideways across the ring, Hammer had settled into a rhythm reminiscent of her previous contests. Shields landed a couple of eye-catching shots, when Hammer was on the move, to signal her aggressive shot selection. A particularly pleasing overhand right, thrown when the American was almost tucked up into the armpit of Hammer, prompted a momentary clinch of recognition. The contest was being fought a good pace, producing an enjoyable fight, and Shields was upping her punch output with each passing round. Hammer continued with her constant circling of the ring but was struggling to settle into a similar rhythm with the punches, and the pre-fight favourite was able to pick her off with the busier work. Such is the nature of two minute rounds that a well-placed flurry of shots could be enough to claim you a quiet round. Interestingly as the fight progressed it was the movement of Shields that started to come to the fore, evading the downwards punches of Hammer with a casual duck-and-weave motion. It was smooth to watch the first time, even more glorious in slow-motion. More importantly it showed the different dimensions to the Flint based boxer; Hammer, as good a fighter as she is, was unable to adapt to the varying tactics coming her way. Having began as the instigator, Hammer quickly struggled to replicate any of that initial impact as she ran firmly into a brick wall. Shields was dominant, it has to be said, and looked superfluous in every aspect. On the front foot she was capable of forcing the pace of the contest, landing with aggression. On the backfoot she was able to pick Hammer off with the jab and was defensively astute, too. After several rounds of sheer frustration, the German eventually returned to her form from the first round. That trademark sideways movement appeared lost in certain rounds and it was no coincidence that, when she reverted to her light and bouncy footwork, she began to enjoy more success. That success was immediately followed up with a huge round for Shields who simply went at it for the duration of the eighth round, knocking the gum shield of Hammer out and rallying relentlessly with an endless barrage of power punches that made her, 24 fight opponent, looked like a novice. Chilling accuracy from Shields, simply chilling. The final two rounds were yet another dose of dominance coming from the home corner with cruise-control firmly engaged. There were two world champions in that ring but you would never have guessed given the way in which Shields stamped her authority over the contest. 98-92, 98-92, 98-92, to become the undisputed middleweight champion of the world. Earlier in the night Otto Wallin opened up the televised broadcast from Atlantic City, a little after 9pm local time, with the Swedish southpaw looking to go 21-0 with a first win on American soil. Nick Kisner, a career cruiserweight, was in the opposite corner and was on a two-fight win streak since losing to, WBA International champion, Ryad Merhy. Absent from the ring for 357 days, Ottomatic was looking to ease into life in the United States with an impressive victory. 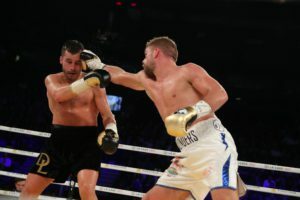 Ranked 5th by the WBA and IBF, Wallin had previously been mandatory challenger for the EBU belt before opting to pursue his options Stateside. When the fight began his size advantage was clear to see – some six and half inches the taller boxer. The 28 year old immediately took to the centre of the ring, using the sheer scale of his legs to stand at distance and tower over Kisner. The American was caught within the first ninety seconds, what by was not instantly obvious, with a cut emerging to the side of the left eye. Blood smeared the cheek of Kisner, in rather un-warrior-like fashion, as he complained he was unable to see. The doctor was called with the referee, David Franciosi, repeatedly asking “can you see or not”. Altogether the scenes were rather farcical with Kisner stating “I can see out of one eye”, prompting Franciosi to call a halt to the contest. Replays showed an obvious headbut – unintentional mind – and the bout went down as a swift no-decision. A rather anti-climatic debut for the talented Swede. The second heavyweight of the broadcast was a scheduled ten rounder between Jermaine Franklin and Rydell Booker. Michigan’s Franklin had been hitting his media duties hard in the build up to this contest, declaring himself as “already the best heavyweight” all the while accompanied by montages of him flipping tyres and smashing hammers. Franklin weighed in a tangerine over 245lbs, the heaviest he’s been in since May 2016, half a stone more than his counterpart but stood, officially, two inches the smaller man. Booker, meanwhile, arrived on a three fight win streak since resuming his professional career last year following a lengthy hiatus, largely spent in prison. In carrying that excess weight, 18lbs more than his last fight, Franklin looked a little out of shape but snapped out his jab in sprightly fashion from the off. As he threw the jab he would shuffle his whole body into the punch, prompting Booker to sit firmly on the back foot. Constantly chipping away territorially, Franklin was landing the better of the punches but Booker had decent speed of movement in response. Despite the punching pressure coming from Franklin it was Booker who seemed to be keeping the pace of the contest within his comfort zone – a steady, cooled down tempo. Franklin was looking for flashy shots to match his brash pre-fight braggadocio. Twisting his body into each shot, in a manner not too dissimilar to Samba dancing, the 25 year old was trying to look more impressive than the sum of his shots. Thoughts of what might have been for Booker seemed to crop up throughout the contest as he made Franklin look, distinctly, average. The older fighter was looking composed in the face of wild, swinging shots and, despite possible assumptions, he simply was not tiring. The final couple rounds of the fight saw Booker having his best spells, some sluggish chipping uppercuts catching Franklin on the chin before the 38 year old followed up with classy combinations. A fight that never managed to ignite into anything spectacular but rather produced frustrating viewing. Franklin landed with more frequency and consistency, catching Booker flush on a fair few occasions. It was learning fight, as the old adage goes, but, more frankly, it just wasn’t good enough. 99-91, 98-92, 98-92, in favour of Jermaine Franklin. 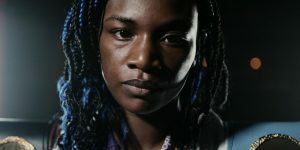 The story of the night belongs firmly to Claressa Shields who delivered on her promise of dominance. For the first time in a long time, as well, she did it in an entertaining manner. Her last few performances have been a relatively damp but this event, this occasion, seemed to bring out the superstar within her. She became undisputed middleweight champion of the world with a frightening intensity. The greatest female fighter of all time? I can’t see anyone that comes close. Worryingly, too, she’s only just getting started. 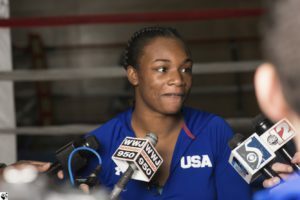 Claressa Shields proclaimed during fight week ahead of her pro debut that she’d be ready for the likes of top boxers Christina Hammer and Cecilia Braekhus by her 7th pro fight. Ever the prophet, the two-time Olympic Gold medalist and reigning middleweight queen remains true to her word—and just two years into her already booming pro career. Shields and Hammer are officially set to collide on November 17 in Atlantic City, New Jersey. 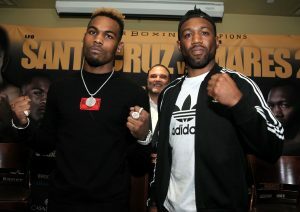 Their scheduled 10-round bout will air live on Showtime, topping a special edition of the network’s long-running ShoBox: The New Generation series. Given the significance, the titanic middleweight clash is more befitting the network’s “Showtime Championship Boxing” series as the winner will become just the second female boxer in history—and just the fifth overall—to lay claim as undisputed champion (WBA, WBC, IBF, WBO) in the four-belt era. Shields (6-0, 2KOs)—who captured Olympic Gold in 2012 and 2016—carries two middleweight belts in tow. The 23-year old from Flint, Mich. claimed both in a 5th round stoppage of previously unbeaten titlist Nikki Adler in their Aug. ’17 clash, marking just her fourth pro fight. Two successful title defenses have followed, including a 10-round win over Hanna Gabriel in her most recent outing this past June. 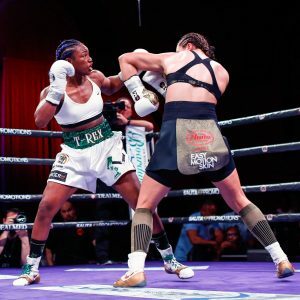 That show set the stage for this forthcoming clash, with Hammer (23-0, 10KOs) appearing in the Showtime-televised co-feature in a 10-round decision victory of her own, besting Tori Nelson (whom Shields outpointed in January). It was clear from the moment the show was scheduled that the intention was to lead to a head-on collision. Hammer—a two-division champion from Germany by way of Kazakhstan—won her first belt in just her seventh pro fight, way back in Oct. ’10 as she serves as the longest reigning active major titlist today, female or male. The 28-year old has racked up 14 title defenses, along with pit stops at super middleweight—where she bested previously unbeaten Zita Zatkayo in their May ’13 vacant title fight—and a super welterweight title win over former pound-for-pound queen Anne Sophie Mathis that was later changed to a No-Contest. Despite her lengthy title reign, a desire to become the absolute best prompted a change in scenery. Having spent her entire career in Eastern Europe, Hammer made her stateside debut on the aforementioned shared card with Shields in June. The goal was to land the American boxing star in the ring, and now gets her wish. The winner will join Bernard Hopkins, Jermain Taylor, reigning pound-for-pound queen Braekhus and pound-for-pound king Terence Crawford as the only boxers in history to simultaneously own all four major belts in the same weight division. There have been higher profile female boxing events in history—most famously the June ’01 slugfest between famous offspring Laila Ali (Muhammad Ali’s daughter) and Jackie Frazier-Hyde (Joe Frazier’s daughter), as well as the Aug. ‘03 lopsided money grab between Ali and Christy Martin, the latter whom is credited for restoring notoriety in women’s boxing. Where that side of the sport has fallen miserably short is securing historic matches, as women’s boxing was for too long limited as a sideshow attraction on major shows. Now in an era where females are more empowered than at any other point in history, women’s boxing gets the dream matchup it has long deserved—and has no plans at stopping just there. 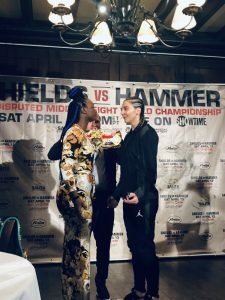 “Shields vs Hammer will break all the barriers and lift women’s boxing to a new level,” Mark Taffet, Shields’ manager assured BoxingInsider.com “It’s that rare, can’t miss fight between two undefeated, unified champions in their prime. All of boxing should be proud of these two women and take the example from them; when the best fight the best, there are no losers. Taffet and Shields joined forces straight out of the 2016 Olympics with this very blueprint in place. With a win on November 17—almost two years to the day of her pro debut—Shields will not only break new ground, but continue to lead by example. This Friday Salita Promotions brings USA Showtime fans the two best female middleweights in the world in separate title defenses. 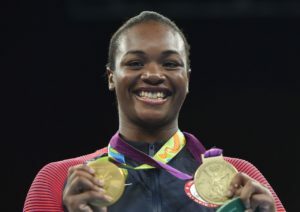 Olympic Gold Medalist Claressa “T-Rex” Shields, 5-0 (2), of Flint, MI, the IBF and WBC Super Middleweight champion drops down to middleweight in quest of two vacant belts in the IBF and WBA Middleweight belts at stake. She will be taking on WBA and WBO World Female Super Welterweight champion Hanna “La Amazona” Gabriels, 18-1-1 (11), of Alajuela, Costa Rica. “It makes me so happy and it just touches my heart to see four female fighters on the main fight poster. I was so happy that they put them on TV. 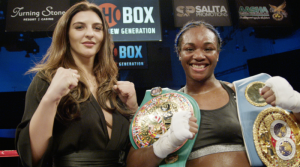 They have put me on before but it’s always been my goal to put other women on so when they decided to put Tori Nelson and Christina Hammer on women’s boxing is going somewhere,” said Claressa “T-Rex” Shields. “I would like to say I am excited and grateful to be here, and share the ring with so many great fighters. I think it’s going to be a great fight night for all boxing fans, and after the weigh-in it will be all on us to make the very best out of all the effort and preparation we have had in these past months,” said Hanna “La Amazona” Gabriels. 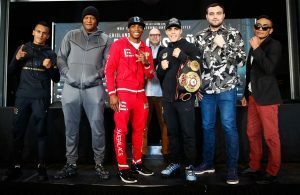 In the co-feature WBC & WBO World Female Middleweight champion Christina Hammer, 22-0 (10), of KAZ, living in Dortmund, Germany, defends her title against the former IBF and WBC World Female UBF and IBA World Welterweight champion Tori Nelson, 17-1-3 (2), of Ashburn, VA, coming off a loss to Claressa Shields in January. “US is the hot spot in boxing. It has always been my dream to fight here and show US that I am the champion and the best female middleweight in the world. I had a great final preparation in Florida. In a gym not white collar work out style, but tough, hot, pure and aggressive. I am in the best shape ever and can’t wait to go into the ring and show US my best performance. I am grateful to Dmitriy Salita and Mark Taffet, are giving me this opportunity. It is time to shine,” said Christina Hammer. Shields and Hammer are on a collision course to unify the middleweight’s four title belts. Shields will be coming down in weight and Hammer up in weight. For Hammer she will be making her US debut. 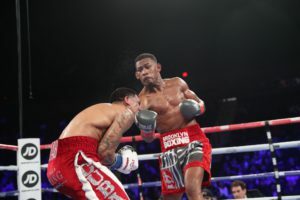 The following is the Boxing Insider notebook for the week of May 29th to June 5th; covering the comings and goings in the sport of boxing that you might have missed. Live coverage for the Frank Warren promoted event will be provided by BT Sport and BoxNation with U.K. sportscasters John Rawling providing the blow-by-blow and Richie Woodhall the analysis. Boxing broadcaster Ray Flores and analyst Chris Mannix will deliver pre-fight and post-fight analysis from Staples Center in Los Angeles for the SHOWTIME Sports audience. JOE SMITH JR. (23-2 18KO’s) makes his much anticipated return to the ring on June 30th at Mohegan Sun Arena, in Uncasville, Connecticut. STAR BOXING’S “SLUGFEST at the SUN” is set to be one of boxing’s best cards thus far in 2018. Already announced as the co-feature bout, highlights Rhode Island Native American warrior, KALI REIS (13-7-1 4KO’s) pitted against Hungarian , SZLIVIA SZABADOS (17-11 8KO’s). Kali is coming off of a historic power punching performance against undisputed champion Cecilia Braekhus, in the first female bout featured on HBO. Kali thrilled fans around the world in that fight, and promises the same action at Mohegan Sun on June 30th. As a union laborer for Local 66 on Long Island, JOE SMITH JR. earned the title of the peoples champion when he burst onto the boxing scene in 2016. Working with a sledgehammer by day, and training by night, Smith Jr. defines hard work and determination. The rise of Smith Jr. began when he took on, top rated light heavyweight, ANDRZEJ FONFARA on NBC in Chicago. As a 20-1 underdog, Smith Jr. destroyed Fonfara in the first round, knocking down the mighty Pole twice, before the referee called a stop to the onslaught. Later that year, Smith Jr. knocked legend, BERNARD HOPKINS on HBO, clear out of the ring, becoming the first person to ever KO the former multi-division world champion. In the main event of Star Boxing’s “SLUGFEST at the SUN,” “THE BEAST” JOE SMITH JR. will be facing Kentucky’s MELVIN RUSSELL (11-4-2 7KO’S). The tough Kentuckian, who goes by the moniker “The Romantic Redneck,” has been in all out brawls with undefeated prospect Mike Wilson (then, 17-0 8KO’s) and world-title challenger Edwin Rodriguez (then, 28-2 20KO’s). Russell has proven the ability to go deep into fights, while still using a come forward offense. Fighting behind his jab, Russell will look to keep his distance from “THE BEAST” Joe Smith Jr., attempting to avoid his devastating power. There might not be a more well-rounded fighter on the planet. Mike Lee (20-0, 11 KOs), who takes on Jose Hernandez (19-3-1, 9 KOs) this Friday night for the WBO Junior World Light Heavyweight World Title at The Allstate Arena in Chicago, brings all the intangibles that one would want in a professional athlete. Women’s boxing seems to be coming to the forefront today. The two most interesting and successful in this writer’s opinion are Christina Hammer from KAZ fighting out of Germany currently in the US. Hammer is 22-0 (10), and holds the WBC and WBO middleweight titles. She is to women’s boxing in Germany that Golovkin has been to men’s boxing and in the same weight-class. Hammer will be defending against former champion Tori Nelson, 17-1-3 (2), of Auburn, VA, on June 22nd at the Masonic Temple in Detroit, VA. 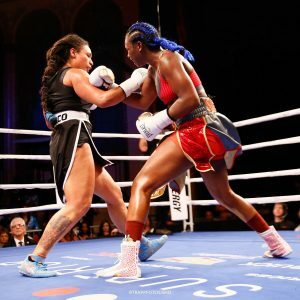 In January she lost for the first time to Olympic Gold Medalist Claressa Shields in a Super Middleweight title defense of her IBF and WBC titles. Hammer has been a world champion since 2010 and has had a dozen successful title defenses. Only five of her twenty-two fights have been out of Germany and this will be her American debut coming up. With Gennady “GGG” Golvokin being the best in their country of KAZ she may be in his shadow but hands down she is the best female boxer and certainly one of the top boxers in the world today. Welterweight IBF, IBO, WBA, WBC and WBO world champion Cecillia “First Lady” Braekhus, 32-0 (9), will be defending her titles as mentioned previously and will be fighting Kali “KO Mequinonoag” Reis, 13-6-1 (4), from Providence, RI, managed by Philadelphia’s Brian Cohen. She lost her WBC and WBO title in November of 2016 to Hammer which was their second meeting, but has won her last three fights. Braekhus in her eleventh fight won the WBC and WBA titles defeating Vinni Skovgaard, then 7-0, of Denmark, in March of 2009. She has defended her titles twenty-three times. She added the vacant WBO title in 2010 and the IBF title in 2014. Braekhus’ last four fights are in her now homeland of Norway being born in Colombia. Since winning a world title in 2009 she has defended her title ten times in Denmark. She has had three defenses in Germany where she won her first world title. It was back in 2008 that Braekhus made her American debut so it’s now some ten years later she marks her return to America for a world title defense. She is very popular in Colombia and Norway let alone Denmark and Germany. Braekhus has defended her title against three previously unbeaten challengers. In 2017 she had big wins over Klara Svensson, 17-1, and Erica Farias, 24-1. In 2013 she stopped veteran American Mia St. John. She has more defenses than any female boxer with the exception of Germany’s Regina Halmich and is looking to pass her in the future. The following is the Boxing Insider notebook for the week of December 12th to December 19th, covering the comings and goings in the sport of boxing that you might have missed. Unified Women’s Super Middleweight World Champion Claressa Shields met with local members of the media and took part in an open-to-the-public workout on Tuesday at Kronk Gym, exactly one month away from defending her 168-pound WBC and IBF titles against undefeated IBF mandatory challenger Tori Nelson on Friday, Jan. 12 live on SHOWTIME. “I am calm – focused – but still hungry like a challenger with the added confidence of being a world champion. I took some time off after my last win but I look forward to getting busy again in 2018. “This training camp I did eight weeks instead of six. A lot of camp has been extremely hard. But I’m so focused and determined on 2018 and starting great and staying busy. I expect my opponent to apply pressure, and to use some dirty tactics. She has more experience, but not that much when you speak of her amateur experience. “There is no doubt I will start 2018 with a win. Then I just take it one fight at a time. Right now my focus is Nelson. “I’m excited to be on SHOWTIME as the first fight of the year, and just to be back inside the ring. I feel I have been the face of women’s boxing for some time now. I don’t let it feel like pressure – I just work really hard in the gym. “Training through the holidays is fine. The difference between the amateurs and now is that I was always in other countries competing. Now I get to be home with my family getting ready and I feel good. Esteemed boxing writer Lance Pugmire of the LA Times recently reported that a deal for a rematch between Canelo Alvarez and Gennady Golovkin is very close to being finalized. Pugmire reported that Eric Gomez, the president of Golden Boy Promotions, texted him and indicated that there only a few items left to discuss with Golovkin’s promoter Tom Loeffler to finish the agreement. 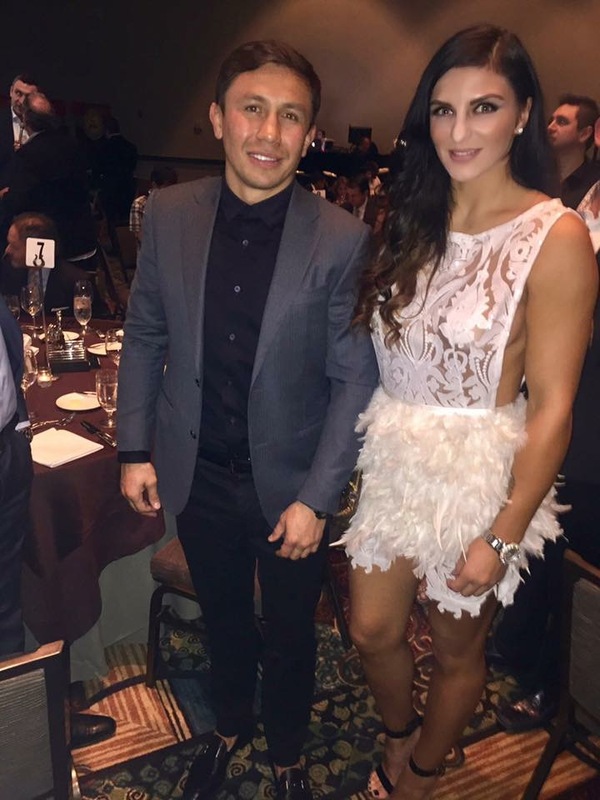 Two Kazakhstan Born Unbeaten World Middleweight Champs, Christina Hammer and Gennady Golovkin! How rare it is to have two boxers born in a country like Kazakhstan to have both male and female boxers reign as unbeaten world middleweight champs? The boxing world is certainly aware of Gennady “GGG” Golovkin, 36-0 (33), with his last 23 being by knockout. He started his boxing career in Germany fighting 18 of his first 19 fights there. He has had 9 in the US, 3 in Monaco, 2 in Panama and 1 each in Denmark, Ukraine KAZ and UK. He moved to the USA and settled in L.A., California. He is one of or in this writer’s opinion the No. 1 P4P boxer in the world. He has 17 title defenses. He holds the WBC, WBA, IBF and IBO world titles. The other world champion Christina “Lady” Hammer, 20-0 (9) 1nc, is less known but holds both the WBO and WBC world titles. She was born in Novodolinka, KAZ, 26 years ago and now resides in Dortmund, Nordrhein-Westfalen, GER. Hammer won the WBO title in May of 2013 and has defended it six times. She won the WBC title in her most recent fight in November of 2016 in a unification re-match with Kali Reis, of Providence, RI. She has boxed 18 of her fights in Germany, 2 in Slovenia and 1 in CZ. Hammer is trained by Dimitri Kirnos and was managed by Ulf Steinforth. Her promoter was SES (Sport Events Steinforth GmbH) until May of 2016. Her current promoter is Alexander Petkovic’s Petko’s LMS Box Promotions. Neither ever fought on the same card. “I was so excited to meet the Best Middleweight champion GGG ever at the 54th annual WBC Convention in Miami On December 12th of 2016,” said Hammer.